There is nothing more motivating then summer weather. 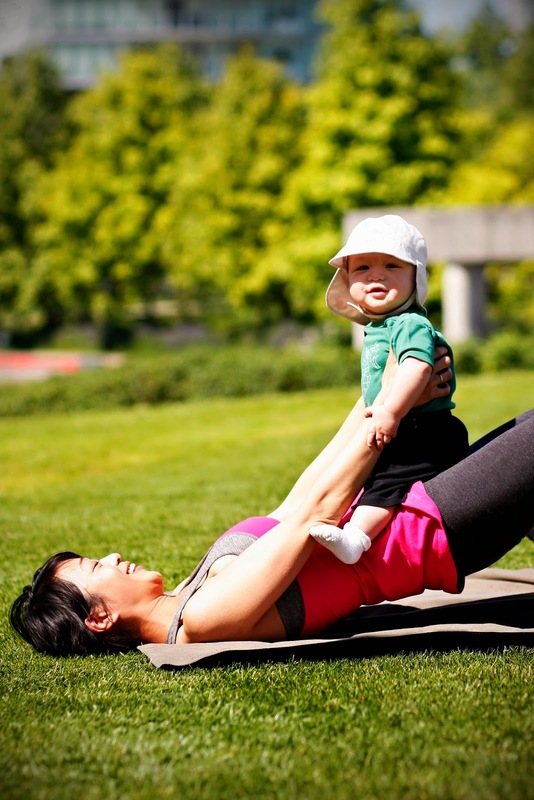 Before you hit the seawall or trail with your stroller, make sure you are prepared. Both you and your baby need to be protected from the sun. Mom should be wearing SPF 30 sun block, sunglasses and a hat. Sunscreen is not recommended for babies under 6 months. Invest in a stroller sun cover for younger babes. Babies over 6 months should also wear a baby-friendly SPF 30 sun block. Don’t forget those tiny toes! Add lightweight long-sleeved/legged clothing a sun hat and sunglasses and you are ready to go. Be sure to drink before, after and during exercise – especially outdoors. A good rule of thumb is ½ a water bottle before, a full water bottle during and ½ a water bottle after. Don’t let dehydration zap your energy. As tempting as it might be to power walk or even run in a sports sandal, resist the temptation. Doing so can lead to injuries and let's face it, you don't have time for an injury. Invest in a new pair of athletic shoes and make sure they suit your purpose. “Running” shoes are really meant for running. If you are going to be doing more walking or perhaps participating in a stroller fitness or boot camp type class – consider a cross-trainer. Your ankles will thank you. Take care of your breasts and back by wearing a well-fitted sports bra. We love the Moving Comfort line because they fit well, are very supportive and at least 3 designs allow for easy access if you are breastfeeding. Lady Sport in Vancouver B.C. offers plenty of selection as well as a 10% discount for our current clients.